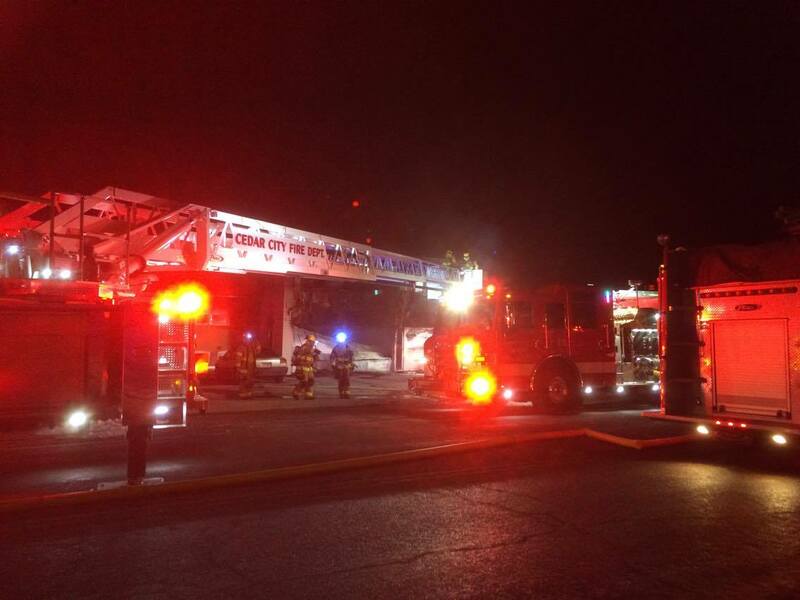 CEDAR CITY — The Cedar City Fire Department responded to 100 W. 200 South on a report of a house fire Wednesday evening. At approximately 7 p.m., Cedar City police were called out to the fire, which had consumed most of the garage. When they arrived, Cedar City Police Patrol Corporal Clint Pollock said they got someone out of the house and contained the area until the fire department arrived. What started the fire is still largely unknown, Pollock said, though it’s suspected that the furnace was a part of the cause. He also said that he doesn’t know if there are any injuries as of yet. Once the fire — which is contained and mostly extinguished — is fully put out, there will be a further investigation. Neighbors and passersby were alerted to the fire by the large, black smoke cloud rising up and stopped to watch as firemen put out the large flames. The whole block of 200 South from Main Street to 100 West has been blocked by police officers. Cedar City Fire Department, Gold Cross Ambulance and Cedar City Police Department responded to the incident.